Tags: new content, patch notes, bw2, kaine. Chat about these changes here! Tags: new content, bw2, flux. One of the most common requests we have from end-of-game players is a way to revisit old Flux puzzles, followed up by a way to use and recombine old Flux trinkets. With the update today, we are doing both! As of the update today, players who have reached the current Flux will be able to teleport to previous Fluxes and get trinkets they missed or just complete different puzzles if they get tired of the latest one. Want to get started? Talk to the "glitch" with the !!! over its head to teleport between Flux's. Once you arrive in a prior Flux, you'll notice one major change: all the Devs in previous are ghostly and won't say anything (because we didn't keep any of their old dialog, whoops! ), but you can watch the "studio " expand with new Devs, as we evolved over time. The next major change is that instead of receiving 10,000 gold after finding all 8 Flux Trinkets for a given Flux, you will now whack up Flux Dust. Flux Dust can then be used to buy special Custom Items, a custom pet, or to upgrade a special "Super Trinket" that can only be obtained and upgraded in the Flux. 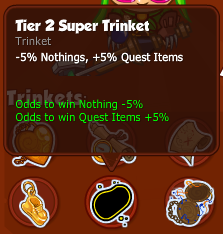 So What is the Super Trinket? 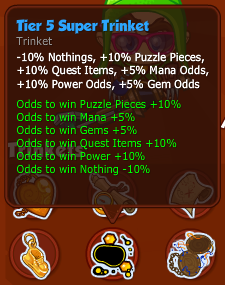 As indicated above, the Super Trinket can only be created in the Flux. This trinket can be upgraded more than 50 times - each time you upgrade it, you can modify a different stat, but each group of stats must be added before the next tier will unlock. You will need to collect all 8 trinkets from a specific Flux, before they can be traded for Dusts (and clean up the trinket inventory). Talk to the woman in the blue shirt and bowler hat in the Flux to access the Flux store and Super Trinket upgrades! If you didn't catch our update yesterday, please visit the CNE Community Blog for an important note. Tags: new content, patch notes, bw2, flux. - Glitch where Big Trout/Squid could be doubled - You'll now only ever receive one. - Reveal issues with Reggie and Levi in the Mushroom Core. Chime in about these changes here! I wanted to let everyone know that tomorrow (Fri Nov 21) will be my last day at Codename. I have accepted an opportunity which will be taking me along new (but familiar) directions. I want to thank CNE for allowing me the opportunity to work with them for the last year and for taking a chance on me. To you, our dear community, I thank you for the honour and privilege of having worked with and served as your voice here at the studio for the last year. I have enjoyed our time together immensely, and I will absolutely miss seeing everyone in chat and on the forums. Probably most surprisingly, I'll miss reading through everyone's thoughts and comments from the event feedback, from pet requests (bunnies!) to suggested improvements, your thoughts and feedback help us shape games that we want to make, and you want to play. Be patient with who comes next (it could be you - we're hiring!). They will do things differently. But I am confident that whomever they are, they will serve you with the passion and dedication that everyone at Codename does. First off, we want to congratulate Chloe on her new role. She has brought a lot to our community and studio. She will be missed! However, our sadness is lessened by the knowledge that she is going to an exciting new opportunity. We wish her all the best. Community is incredibly important to us here at Codename - it is one of the four pillars of our studio model! So while we search for that next 'great fit', we want to explain how best to get your issues and feedback heard. Not sure about a quest unlock during an event? Facebook updates will still be created, so you can always see what's been unlocked in a BW2 or EBA event! Have a suggestion for Events or for BW2 or EBA in general? Include them in the Event Feedback Surveys! This are read after each event, and we make changes *directly* because of this feedback. Don't like something? Let us know! Like something? Let us know that too! We love making games, but we love to make games that YOU love to play. Share your thoughts with us and YOU can help US make these games better! Having issues with your account? Open a support ticket directly from the top of the game window! As we settle into more regular updates and add more content, we will begin producing formal updates for both content and change logs. Keep your eyes peeled for more information on both of these! And now we return you to your regularly scheduled gaming! Here Turkey Turkey! Where are you Turkey?? Tags: event, new content, eba, thanksgiving. Are you ready to stuff yourself full of tryptophan?! The Pilgrim Monkey is on hand to ensure that the bounty of the fall is harvested, to prepare an epic feast for all the Monkey's to enjoy. Help him prepare the Thanksgiving meal by decorating the table and filling it with delicious food stuffs. 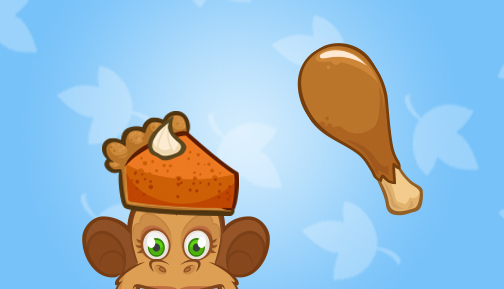 Collect wild turkeys and earn trophy room items, or check out the available Extras in the Pilgrim Monkey's store! Note: We are closely monitoring your event feedback after each holiday event, and are making ongoing improvements to the balance of event gameplay. Want your opinion heard? Make sure you send us your thoughts at the end of the event! - Collect 18 different types of supplies to prepare for a feast, of ever increasing amounts. Why do you not get to roll them forward? Because each item you are collecting is different, and eggs can contain only one type of item. Yams are not gravy boats are not peas are not candle sticks. 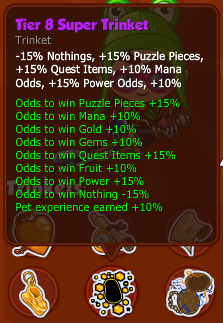 If you are getting close to the end of an item, use your multipliers carefully! 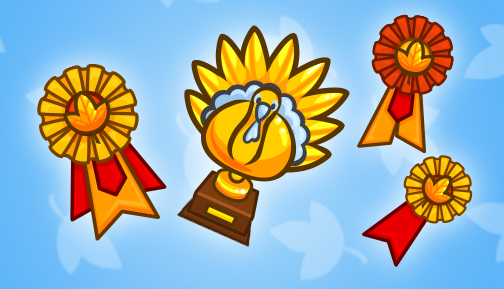 Ribbon and Trophy (if earned) are awarded after the event finishes on December 3, 2014. The highest ribbon earned will be awarded. As you break eggs, wild turkeys appear and wander around the screen. Gently tap the turkey before it's gone! The turkey will try to escape, but one painless tap and magically you have a fragrant, perfectly cooked turkey! At the 1st, 50th and 250th turkey found, you will unlock special decorations for your trophy room. Turkeys will continue to appear after you have earned the last achievement, but you can continue to hit them. Hitting additional turkeys will not grant additional benefits. Unlimited Turkeys! After you have earned the Thanksgiving Trophy, you can continue to earn Turkeys, which can fill up your Trophy room - some plucking may be required, if you're hungry. - Must be used by 11:59:59 PM PDT on 2014-12-4! 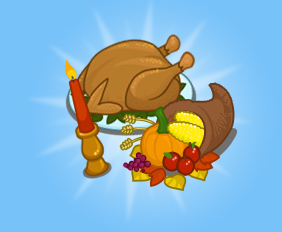 The Thanksgiving Event will run until Wednesday December 3, 2014 - Noon PST. Chase the Turkeys in Bush Whacker 1! Tags: event, legacy games, bw1, thanskgiving. It's Turkey Wranglin' time again! Jebediah the Turkey Wrangler has appeared once more in Southeast Haven and is looking for intrepid bush whackers to help collect turkeys! You have up until December 2nd at noon to collect as many turkeys as you can. 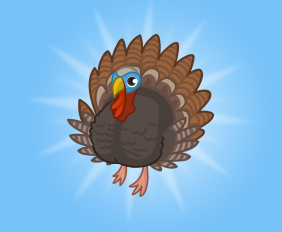 If you collect 200 turkeys, you'll get a special turkey pet! Players who participated in this event last year can partake again to earn another turkey ribbon, which will stack with any ribbons they won last year! Good luck! Tags: patch notes, event, bw2, thanksgiving. ...Where Mrs. Robinson has the wrong text in the school room. ...Typo in Misty's "Hatching" quest description. ...Typo in the description of the Canary quest item. ...Typo in the description of the "Chainsaws for Chiana" quest. ...Typo in the description of the "Pizza for Peter" quest. ...Typo in the description of the "Mushroom Paint for Pete" quest. ...Typo in the introduction text for the "Glowing Mushrooms for Geoff" quest. Chime in on the changes here!